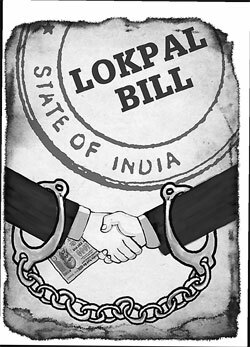 Finahub Official Blog: Jan Lokpal Bill - What is it and Why we need it? The Lokpal will be a three-member body with a chairperson who is or was a chief justice or Supreme Court judge, and two members who are or have been high courts judges or chief justices. Implementation of the Lokpal bill will hopefully reduce corruption in India. The basic idea of the Lokpal is borrowed from the office of the ombudsman in other countries, like the HongKong ICAC. It provides for filing complaints of corruption against the prime minister, other ministers and members of parliament with the ombudsman. Anyone, except for a public servant, can file a complaint and the Lokpal has to complete the inquiry within six months. 2. Similar to the Supreme Court and Election Commission, they will be completely independent of the governments. No minister or bureaucrat will be able to influence their investigations. 3. Cases against corrupt people will not go on for years anymore: Investigations, in any case, will have to be completed in one year. The trial should be completed in next one year so that the corrupt politician, officer or judge is sent to jail within two years. 4. The loss of a corrupt person caused to the government should be recovered at the time of conviction. 5. How will it help a common citizen: If any work of any citizen is not done in prescribed time in any government office, Lokpal will impose a financial penalty on guilty officers, which will be given as compensation to the complainant. 6. So, you could approach Lokpal if your ration card or passport or voter card is not being made or if the police are not registering your case or any other work is not being done in prescribed time. Lokpal will have to get it done in a month's time. You could also report any case of corruption to Lokpal like ration being siphoned off, poor quality roads been constructed or panchayat funds being siphoned off. Lokpal will have to complete its investigations in a year, the trial will be over in the next one year and the guilty will go to jail within two years. 7. But won't the government appoint corrupt and weak people as Lokpal members? That won't be possible because its members will be selected by judges, citizens, and constitutional authorities and not by politicians, through a completely transparent and participatory process. A country where economics is a problem and inflation or recession is the order of every quarter or fiscal one should look at stabilizing the present infrastructure by fighting actively against corruption.